Students lined up in the Muenster University Center to check in for Dakotathon, a 24-hour long event celebrating the money raised for Children’s Miracle Network Hospitals. The money raised by USD students will go directly to Sanford Children’s Hospital. 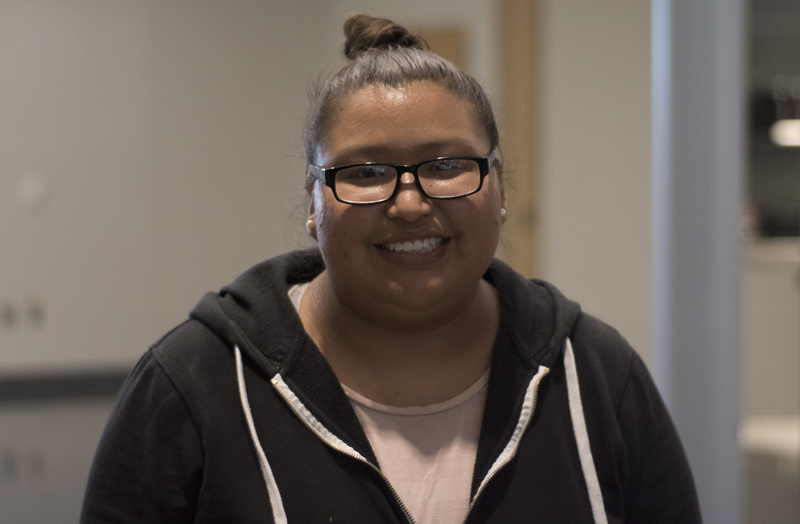 Students who sign up to participate in Dakotathon are asked to raise $150 for the cause and have a whole year to raise the amount. Last year, more than 250 students participated raised more than $108,000. This year’s goal is $115,000, according to Dakotathon’s website. Before the total amount of money raised this year is revealed, 24 hours of dancing and fun will ensue. To kick off the event, Miracle Children and members of the executive team for the event were announced. This year’s theme, a sea of miracles, transformed the MUC into an ocean scene for the visiting children, who will spend the day with USD students. The event is designed to let them have fun away from their usual routine of clinical visits and checkups. Senior Allie Pfauth said it’s her first year participating in Dakotathon. Dakotathon participants piled in Aalfs Auditorium for a magic show featuring illusionist Reza. 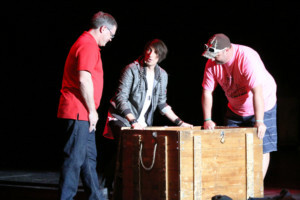 The illusionist performed several tricks, including escaping from a box. He also invited several members in the crowd to assist with some of his tricks. Sophomore Ashlyn Hartman said the illusionist show was interesting, and said the events thus far have been worthwhile. Following the show, there were two family talks in Aalfs before the crowd walked to the Wellness Center. There, the Morale Dance and the Miracle Basketball Game began. USD basketball members and children participants played against each other at the Wellness Center. Hartman said Dakotathon is an important event. Sophmore Brandi German said Dakotathon showcases the children that participate in it. “It’s only one day throughout the year that they’re really the center of attention,” German said. German and Hartman said they were planning to stay up during the entire run of Dakotathon. 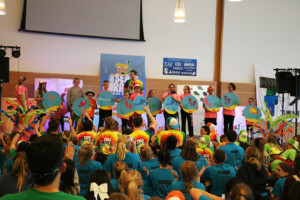 The 24-hour dance marathon continued through the evening with more family talks and morale dances followed by a performance by the Midwest Dueling Pianos group in Aalfs Auditorium. 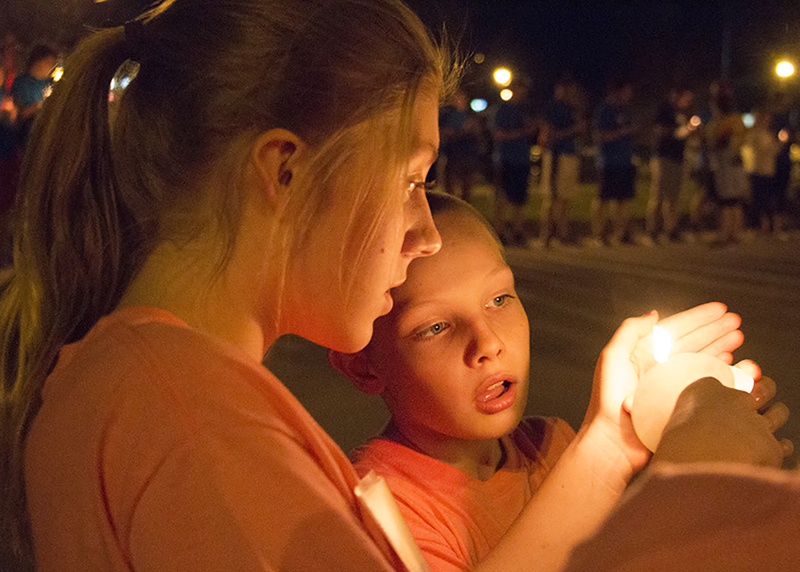 After the performance, the Dakotathon crew walked to the Wellness Center parking lot for a candlelight vigil. Joy Haugan, the mother of Olivia, a miracle child, said that time of reflection is the most important part of Dakotathon. A brother of Tanna Kingsbury, who lost her fight with cancer in 2014 at the age of 15, spoke during the vigil. Other names were read of those who’d lost their battles, and a moment of silence was held for them. “We know some of the kids and we are so thankful and blessed that our daughter’s name isn’t on that list,” Haugan said. “It also reminds us again that it is so real and you know, we’re here this weekend. We’re having a great time celebrating, but it could very well have been the other way for us, too. Haugan and husband Ryan’s daughter, Olivia, had cancer when she was two years old. When she went through treatment, they met many of the families they’re able see at Dakotathon. Olivia had to think hard about what her favorite part of the day was since it’s her favorite part of the entire year, her mother said. But the fact that she and other miracle children got to ride around in style was not overlooked. “Hm…I liked riding in the limos,” Olivia said. Haugan expressed her gratitude for USD and the students involved in the event. Having stayed up all night, most of the faces at Dakotathon looked tired but awake. At 7 a.m., the students at Dakotathon participated in a morale dance. The dancing lasted about half an hour and featured many different genres and styles of music. Dancers were the largest part of the crowd early in the morning, who were immediately recognizable in their bright blue shirts. After the dancing, the students were given breakfast, during which they were given the chance to write inspirational cards to the children who will be benefiting from the money raised. A choir also came and sang. 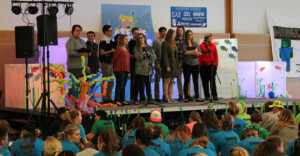 It was the closing ceremony of the 24-hour dance marathon as everyone filled the MUC ballroom to end the celebration and find out the amount raised by this year’s event. After watching a video compilation of past Dakotathon events along with pictures and videos from the years, awards and prizes were handed out. Dean of students Kim Grieve joined the student leaders on stage to thank everyone that participated before the children lined up on stage to reveal what everyone was waiting to find out: if the goal was met. The original goal of $115,000 was surpassed by about $30,000 for a grand total of $145,422.55.